This was a session of substantial success in advancing the VEA agenda. Let me first address advancing the critical issue of funding our public schools which serve 94% of Virginia’s students. They are Virginia’s future. Governor McAuliffe’s introduced budget invested $864 million in additional funds for our schools, setting a high bar for the General Assembly. The conference report which passed both chambers on March 11, includes a $892.3 million dollar increase in direct aid for public education. This is significant progress, and as you can see from the chart on the screen, progress was made on recouping funds lost during the Great Recession. However, when inflation is considered the chart shows a different picture. On the school funding front we can celebrate success with the realization that we have far to go. And reaching the goal of making up for lost ground will still leave Virginia with a low ranking in state support for public education. In 2012 the General Assembly passed legislation including a stair-step approach to full funding of the VRS Board’s certified contribution rate. This is extremely important, as full funding will reduce the unfunded liability and reduce the perceived need to reduce pension benefits. The General Assembly is not only keeping its promise in this regard, the teacher fund will be fully funded in July 2017, one year ahead of schedule. This will be the first time the Board Certified Rate has been funded since 2001. VEA commends the General Assembly for achieving the full funding goal in this biennium. The introduced budget provided no state incentive funds to provide salary increases for next school year. We made gaining first year funding a top priority. Delegate Yost and Senators Chafin and Sturtevant proposed amendments to provide first year funding, and with the help of Senators Howell and Newman, the Senate included first year funding in their budget. You went to work with messages to the budget conferees, and while we fell short of our initial salary goal, for only the third time since 2008, we did gain some funding for the state share of a salary increase for teachers and support personnel. Something is better than nothing, but this meager increase will not put Virginia in a position to attract and retain the high quality instructional personnel in this time of teacher shortages. In VEA’s continued efforts to protect the confidentiality of teacher performance indicators, we have repeatedly sought the help and advice of Delegate Jim LeMunyon. Some of you will remember his HB1889 in the 2013 session. This year he sponsored HB524. which preserves the confidentiality of teacher performance data. Under Jim’s able patronage, HB524 passed the House 98 to 0, and passed the Senate 38 to 0. We deeply appreciate Senator Norment’s patronage of SB564, which preserves the confidentiality of teacher licensure and re-licensure applications. Those who know Senator Norment know him to be fiercely combative, but that is balanced by his thoughtfulness and eloquence. He is a Senator’s Senator, and is deeply respected by all members of the General Assembly. He also possesses a deep sense of fairness, and that is why he was the perfect sponsor for this bill. SB564 sailed through the Senate, 40-0, and passed the House 93-3. Sometimes it pays to have the right sponsor. In 2007 the late Senator Yvonne B. Miller and Senator Norment, at VEA’s request, successfully sponsored resolution (SJ372) to study the feasibility of a state-wide health insurance experience pool for educators and local government employees.” AND we’ve been fighting for it ever since. This year Senators Chafin, Vogel, and Delegate Kilgore led the charge for us on this issue. It was Senator Chafin’s SB364 which proved to be the vehicle for final passage of a bill establishing the framework for a state-wide pool. For VEA this is a major legislative accomplishment, and a lesson in the value of persistence – we worked it for a decade! As the 2016 Legislative Session began, it was assumed that the charter school constitutional amendmet would pass. Perhaps, they underestimated VEA and our partners in this battle, VSBA and VASS. No battle was harder fought in the 2016 session than our successful efforts to defeat the charter school constitutional amendment. We owe deep thanks to the Virginia School Board Association and the Virginia Association of School Superintendents, who were with us every step of the way in this battle. We thank Governor McAuliffe for vetoing two measures, which passed despite our best efforts. HB8 was a problematic virtual school bill which will open Virginia to corporate virtual providers. In other states such schools have resulted in low graduation rates, poor academic performance, and high dropout rates. HB389 was a special education voucher bill which requires no review of student progress, as is required by IDEA, and there are no due-process provisions for parents if progress is not being made, as is required by IDEA. The bill contains no accountability for the quality of instruction provided and the use of the funds is wide open. The inclusion of sectarian schools also raises a serious constitutional question. According to multiple studies analyzing voucher programs, students offered vouchers do not perform better than their public school peers. Indeed, public school students have actually been found to outperform private school students when test scores are weighted to reflect socioeconomic level, race, and disability. We thank Governor McAuliffe for vetoing both of these bills. The 2016 Session established a commission and two committees which will require our participation. It is worth noting that VEA is the only teacher group recognized by the Speaker to serve on the Pension Commission, and the only teacher group named by the Chairman of the House Education Committee to participate in the study of the future of public elementary and secondary education in the Commonwealth. Our voice is a critical one as policy is developed. The battle continues, but as the dust clears on the 2016 General Assembly it is clear that VEA had a most successful session. Please click here to send a message to Governor McAuliffe urging his veto of HB 8 and HB 389. Both are bills which siphon off funds from our public schools. Thank you for your service to our Commonwealth. I write today urging you to veto HB 8 and HB 389. HB 8 will open Virginia to corporate virtual providers who do not have the welfare of Virginia students as their top priority. It sets up a virtual school board and a statewide virtual school. When established in other states, such schools have been plagued by low graduation rates, poor academic performance, and high dropout rates. This is just what we are doing now. VDOE is piloting an online high school program. Virtual Virginia enrollment continues to grow, and many local school divisions, by virtue of individual and collective efforts, are expanding virtual offerings to students. This “incremental approach” is the right path to take. HB 8 is unnecessary. Another major flaw with HB 8 is the funding mechanism. The bill calls for “the average state share of the Standards of Quality per pupil” plus federal funds to be sent to the virtual school by the Department of Education. This figure in not related to any assessment of the cost of providing a virtual program; it is based on the cost of providing the state share of support for a traditional “bricks-and-mortar” school. I also request that you veto HB 389. This bill creates a new government entitlement, which siphons off funds now received by public schools, to create Parental Choice Education Savings Accounts that can be used to pay for education-related expenses. The manner in which the funds can be used is poorly defined. These funds, intended to fund public education, could be used for car payments and college tuition. HB 389 requires no review of student progress, as is required by IDEA, and there are no due-process provisions for parents if progress is not being made, as is required by IDEA. The bill contains no accountability for the quality of instruction provided. The inclusion of sectarian schools raises a serious constitutional question. TAG grants are used to argue that the bill is constitutional, but the courts have drawn a line between higher education and elementary and secondary education in this regard. According to multiple studies analyzing assessment data from voucher programs, students offered vouchers do not perform better than their public school peers. Indeed, public school students have actually been found to outperform private school students when test scores are weighted to reflect socioeconomic level, race, and disability. I urge you to veto HB 389. The pace of the final days of a session is often maddeningly slow. Legislators waited for conference committee reports on the bills which required that the differences between the House and Senate be ironed out. A good example was today conference report of HB8, the virtual school bill, which was accepted by both the House (60-Y 36-N 1-A) and Senate (23-Y 17-N). VEA will be requesting that Governor McAuliffe veto this bill. Two bills, now conformed, Delegate Greason’s HB895 and Senator Miller’s SB336, have the potential to drastically change graduation requirements and consequently our high schools. These bills begin the process of reexamining what graduates need to know and be able to do. Verified credits may become a thing of the past, industry certifications may become a viable alternative to a diploma. We also waited as a consequence of the time constraints of the budget adoption procedures. The rules require 48 hours to review the budget prior to adoption, so the soonest this evening’s budget vote could occur was at 8 PM. But, Virginia has a budget, HB30, for the next biennium, and following adjournment of the House Sine Die, the Senate adjourned Sine Die at approximately 8:35. This session, my last as your chief lobbyist, is over. Please look for a session summary posting in the weeks ahead. The briefings on the conference reports on the budget bill were today, so we can go from speculation to hard facts in regard to the budget. The budget bill now before the House and Senate has $73 million more for public education that the introduced budget. Of that $73 million, $51.1 million was provided for the "teacher" increase for next year. The 2% salary increase will begin in December 1. Remember, "teacher" includes all SOQ positions, and that this funding will help your school board to provide raises. The budget also fully funds the VRS Board Certified contribution rate to the teacher retirement fund in FY 18. This is a year ahead of the scheduled transition to full funding agreed to in the 2012 session. Governor McAuliffe’s initial budget set the mark fairly high. Few who I talked to prior to the session anticipated that the Republican controlled legislative branch would provide more funding for public education than what he proposed, but that is just what happened. We owe thanks to the budget conferees in the House (Delegates Cox and Greason) and Senate (Senators Newman, Howell, Norment and Hanger) who handled public education funding in the budget bill. We end up making significant progress in recovering the funding we lost in the Great Recession, but we still have a ways to go. It is my sincere hope that we are beginning an era in which support for public education is truly bipartisan. Our efforts to gain state support for a teacher salary increase next year paid off. This funding should help your local school board give an increase for next year. In addition, the conference committee report includes $73 million more for public education than what we saw in the introduced budge. The budget proposal makes significant investments in K-12 education, increases flexibility for local school divisions, and makes targeted investments in early childhood education. Invests over $900 million in new funding for K-12 education compared to previous biennium, $73 million more than originally proposed by Governor McAuliffe. Includes a 2% teacher pay raise in the first year of the budget. Re-establishes the lottery proceeds distribution in the second year of the budget, sending 29% of lottery proceeds back to local schools by FY18. The House goal is to fully restore the 40% distribution, which was the policy prior to 2010. Funds the pilot program for mixed-use delivery models in early childhood education and includes $3.2 million to increase Virginia Preschool Initiative slots. Includes $36 million for Cost to Compete in Northern Virginia. Includes $35 million for the at-risk add on to direct funding to schools with disproportionate free and reduced lunch populations. We will attend budget briefings tomorrow, and will be providing a detailed analysis of the budget once the Department of Education releases the numbers. In the years ahead, we need to continue to seek parity with other employee group, as higher education faculty and state employees will receive 3%. Other than the completion of the behind the scenes work of the budget conferees, this was a day of recesses and wasted time. 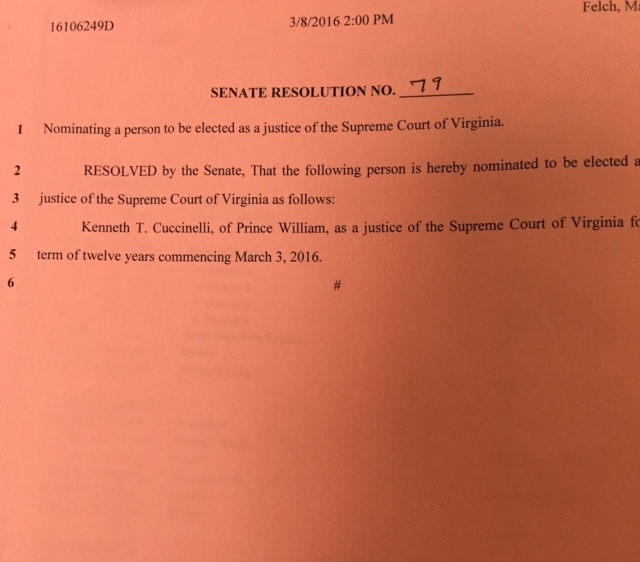 Certainly, Cuccinelli's withdrawal from consideration for the Supreme Court is the headline. It appears that Judge Stephen McCoullough will be appointed tomorrow. We are at the point in the session when all of our legislative battles are done, and we await word on the budget. Rumor is that the work on the public education section of the budget is completed, and that we are actually going to be receiving a little more in funding for our schools that was in either the House or Senate budget proposals. If that is true – that will be a first in my memory. It was hard not to get engrossed in the ongoing battle over filling the vacancy created on the Supreme Court of Virginia when the GA chose to unseat Governor McAuliffe’s appointed justice, Justice Jane Marum Roush. The Republican majorities in both the House and Senate tried to elect Court of Appeals Judge Rossie Alston to the high court but fell one vote short on both the House and Senate resolutions. Senator Glen Sturtevant sided with the Democrats on both votes, so there were only 20 votes to elect Alston, not the required 21. 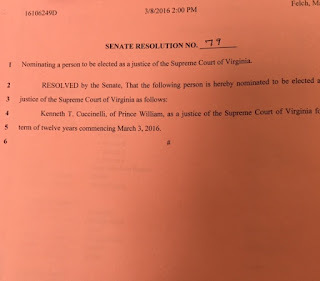 Following today’s Senate adjournment, the Senate Committee on Courts of Justice met to take up judicial appointments, including HR79 with which the nominated Kenneth T. Cuccinelli for the Supreme Court of Virginia. The vote was straight party-line with Sturtevant voting with the majority. This resolution will head to the Senate floor tomorrow. Final passage of Senator Chafin's SB364 (96-Y 0-N) was cause for celebration this morning. This bill may lead to creation of a statewide health insurance option for local government and school board employees. Passage of SB364 reflects years of VEA work. However, for the plan to be successful we need at least 3,000 to 4,000 participants - 10,000 would be ideal. So, we are going to have to go to work at the local level to encourage participation in the new state plan. Details will be available in the months ahead. Our celebration was tempered by the passage of both HB8, Del "Dickie" Bell's virtual school bill and Delegate LaRock's HB389, the parental choice savings account bill. HB8 passed on a 23-Y 17-N vote with Democratic Senators Lewis and Petersen voting with the Republicans. HB389 contains a reenactment clause, requiring that the bill pass again next year before it goes into effect. The vote was 20-Y 19-N with Senator Norment not voting. Back to good news, SB360, Senator Howell's bill which in its amended form requires that the Board of Education create a model exit survey for departing teachers, gained final passage (40-N 0-N). This was another day of waiting for action on HB8 and HB389. Again, both bills went by for the day. There is little hope of stopping HB8, the virtual school bill, but we are only one vote short of stopping HB389. If you are yet to send a messageto your Senator, please click here to do so. We expect a final vote on Monday on both of the bills, but who knows for sure? The final vote on SB364, Chafin’s statewide health insurance bill, should come on Monday as well. The Commonwealth Institute did an excellent analysis of education funding in the House and Senate budget proposals. Click her to see the analyisis. One week remains in the 2016 session! The Senate Education and Health Committee met today at 8, but there were no education bills of great consequence. The House went in early, and the Senate at noon. We waited in Senate Room 2 with great anticipation as HB8 was on page 45 of the calendar, and HB389 on page 47. The Hours of waiting went by and we heard bills about dogs chasing livestock, septic tanks, and mobile food vending in Planning District 8. We got to page 45, and guess what, HB8 went by for the day. But we were sure that we had not waited all day in vain – HB389 was just ahead. Guess what? HB389 went by for the day. It was "That Kind of Day." The good news is that we have more time to lobby these bills. You can help by sending a message to your Senator regarding the LaRock voucher bill, HB389. Click here to send your message now. HB524 Heads for the Governor's Desk, Honor Your Oath or Play Politics? Another VEA initiated bill, HB524, Delegate LeMunyon’s bill to shield teacher performance data from FOIA requests, gained final passage in the Senate on a 38-Y 0-N vote. Thanks to Delegate Jim LeMuyon. This bill now heads to the Governor’s desk. The Senate Finance Committee will take up Delegate LeRock’s HB389 in the days ahead. Both the Constitution of Virginia and the relevant case law clearly reveal that HB389 is unconstitutional. We said the same thing years back about Governor McDonnell’s Opportunity Educational Institution, OEI, and the courts struck it down following the waste of state dollars to set up and defend OEI. Will the Senate Finance Committee ignore us again? We have provided the office of each member of the committee a clear explanation of the unconstitutionality of the bill. In the days ahead, we’ll find out whether this oath is more important than politics. There will be no post tomorrow, as I will be performing my duties as an election official in Richmond City. As we worked through the budget bills from the House (HB30) and Senate (SB30) we were pleased by the significant investment in public education. The House provides a good bit more than the governor had proposed in the introduced budget, and the Senate just slightly less. This won't bring us back to 2009 funding levels (factoring in inflation), but it is a significant step in the right direction. But there are always some things hidden among in the phone-book like budget bills. Often, and unfortunately, budgets do more than appropriate – they legislate. I have heard members of both parties decry the practice, but both sides have been guilty of legislating in the budget. HB30 includes a bill that we have been fighting all session, and which is yet to pass, HB389. For those of you who have not been following closely this is the parental choice savings account bill, which funnels funds away from public schools for questionable educational purposes. Interestingly, the budget also includes language for HB8, the virtual school bill, but the budget clearly states, “This funding is contingent on the passage of House Bill 8." There is no such contingency language for HB389. So, if HB389 passes, and the Governor chooses to veto the bill, he must also line item veto the budget provision, as well, to keep it from going into effect. A.1. The Department of Education is directed to transfer ninety percent of the total of the state's share of the per pupil amount of Standards of Quality, sales tax per pupil funding amount and any applicable special education funding to a school division from which a parent of an eligible kindergarten through grade eleven special education student who has an individual education plan for the purpose of receiving special education services and has applied and been approved for a Parental Choice Education Savings account, pursuant to the passage of House Bill 389. 2. The resident school division shall deposit the received eligible state funds defined in this item, 40.A.1., into such Parental Choice Education Savings Account and such deposit shall be contingent on approval of any prior submissions of required receipts and invoices from such parents for the eligible education expenses for the qualified eligible student. Parental Choice Savings Account solely for one or more of the following expenses on behalf of the qualified student: (i) tuition, fees, or required textbooks at a qualified school; (ii) educational therapies or services for the qualified student from a practitioner or provider, including paraprofessionals or educational aides; (iii) tutoring services; (iv) curriculum; (v) tuition or fees for a private online learning program; (vi) fees for a nationally standardized norm-referenced achievement test, an Advanced Placement examination, or any examination taken to gain admission to an institution of higher education; (vii) tuition fees or required textbooks at an eligible institution; (viii) fees for management of the Savings Account by firms selected by the Plan pursuant to subsection A of § 22.1-222.3; (ix) services that are offered on a fee-for-service basis by a public elementary or secondary school to the public, including classes and extracurricular activities; (x) such insurance or surety bond payments as may be required by the Virginia College Savings Plan Agency; or (xi) transportation, consumable educational supplies, or any other goods or services that are necessary for the provision of the qualified student's education pursuant to § 22.1-254, in exchange for solely educating the qualifying eligible student. 4. Each parent who expends any funds from a Parental Choice Savings Account shall submit all applicable receipts and invoices for such expenditures to the resident school division for review of appropriateness of each expense and possible audit. Each resident school division shall determine, based on the policies established by the Department of Education pursuant to subsection F of § 22.1.222.3, the appropriateness of the submitted receipts and invoices prior to considerations for a subsequent renewal request. 5. The Department of Education and the Virginia 529 College Savings Plan agencies shall be required to manage and audit each Parental Choice Education Savings Account that approved parents have established with an approved financial institution where accounts are maintained." Before we get to the lowdown on GA action today, I dedicate this posting to three champions of public education who have recently passed: Gary Waldo (former UniServ Director in Roanoke, former Senator Madison Mayre, and former VRTA Lobbyist Charlie Todd. May they rest in peace? The docket was full in the Senate Education and Health Committee this morning. Senator Steve Newman is the most efficient committee chairman I have ever seen. He knows how to move an agenda, and he is fair to all. He should train committee chairs. VEA initiated SB564 gained final passage on the House floor on a 93-Y 3-N vote. This bill shield teacher licensure applications from Freedom of Information Acts (FOIA) requests. Thanks, Senator Norment! VEA initiated HB524 reported unanimously and is headed to the Senate floor where it will be on the uncontested calendar. This bill shields teacher performance data from FOIA requests. Thanks Delegate LeMunyon! Now two pieces of bad news, HB389, Delegate LaRock’s parental choice savings account bill reported from the committee on a straight party-line vote. Also, HB8, Delegate Dickie Bell’s virtual school bill was reported re-referred to SFC on a 10-Y 5-N vote. VEA urges your opposition to House Bill 389. This bill creates a new government entitlement at a time when the Commonwealth is unable to properly fund existing core services. For example, when inflation is considered, funding for our public schools is 14 percent below 2009 levels. The new entitlement involves siphoning off funds now received by public schools to create Parental Choice Education Savings Accounts that can be used to pay for education-related expenses. Although this bill has been amended to include only students having a disability, from what we have seen in the states of Arizona and Florida, the ultimate aim of advocates of Parental Choice Education Savings Accounts will be to broaden eligibility. Indeed, the introduced HB389 embraced all students. In Arizona, one year after implementation, the scope was expanded to include students in low-performing schools, students with parents on active military duty, and students adopted or pending adoption from the state foster care system. What if the parent and student are not satisfied with the educational options chosen? The provisions of the bill (lines 56-57) bar them from returning to the public school: “Not enroll the qualified student in a school division in the school year in which the parent receives the Savings Account or the immediately succeeding school year.” The student is stranded and the local school division is left responsible the student’s education despite the absence of state funding. The inclusion of sectarian schools (line 30) raises a serious constitutional question. TAG grants are used to argue that the bill is constitutional, but the courts have drawn a line between higher education and elementary and secondary education in this regard. In accordance with the passage of HB321 in 2012,”Virginia’s “Education Improvement Scholarships,” are now operational but under-utilized. Shouldn’t we evaluate how well this option is serving Virginia’s students before adopting another “choice” option? Two highly controversial public education bills, HB8 and HB329, appear to be headed for a floor vote in the Senate in the days ahead. Here is an overview of HB8. HB8 is a very problematic virtual school bill which would open Virginia to corporate virtual providers. It sets up a virtual school board and a statewide virtual school. When established in other states, such schools have been plagued by low graduation rates, poor academic performance, and high dropout rates. Though an identical bill passed last session, it was amended by adding a reenactment clause requiring the bill to be taken up again this session before it goes into effect. The bill has been before the General Assembly for several sessions, and it originated in a time of optimism regarding the promise of virtual education. Indeed, a view of the value of the stock of Herndon-based K-12, Inc., a major corporate provider of virtual education, shows what “Mr. Market” thinks of the concept. The high for the stock was $39.74 in April of 2011. It is currently trading at $10 a share. This is just what we are doing now. VDOE is piloting an online high school program. Virtual Virginia enrollment continues to grow, and many local school divisions, by virtue of individual and collective efforts, are expanding virtual offerings to students. This “incremental approach” is happening in the absence of HB8, which begs the necessity of the bill. From an educational perspective, virtual education is one tool in the teacher’s tool box. The learning style of the student determines which tools you use. Traditionally, the student, the teacher, and the guidance counselor work together to determine the courses students take. We know that self-motivated students, students with strong time-management skills, and students with the ability to set personal goals are the most successful online students. The parents, teacher, and guidance counselor now serve as the gatekeepers to help students develop the best schedule of courses for the individual student. Parents, guidance counselors, and principals play this appropriate role in the Virtual Virginia model and VEA urges expansion of Virtual Virginia as a better option than HB8. The all-or-nothing approach to virtual schools reflected in HB8 ignores the importance of the jobs our public schools do to work with each student to determine the best course of educational progress. Another major flaw with HB8 is the funding mechanism. The bill calls for “the average state share of the Standards of Quality per pupil” plus federal funds to be sent to the virtual school by the Department of Education. This figure in not related to any assessment of the cost of providing a virtual program; it is based the cost of providing the state share of support for a traditional “bricks-and-mortar” school. The Board of the Virginia Virtual School is neither a local unit or government nor a county, city, town or school division. Virtual Virginia provides a superior and more cost effective option for expanding virtual learning opportunities for Virginia’s students. The VEA urges opposition to HB8. This bill next goes to the Senate Committee on Education and Health where it will be heard tomorrow morning. If your Senator is on the committee, please call urging opposition. Click here to see committee members and here for Senator's contact information. .